Five disabled people have lost their High Court challenge over the government's decision to abolish the Independent Living Fund (ILF). Their lawyers had asked the court to declare "unlawful" the consultation process that led to the proposed axing of the £320m fund. The five are among 19,000 people who receive money from the ILF, which the government plans to scrap in 2015. The scheme aids independent living and the average pay-out is £300 a week. The government has said that councils, which administer most social care, will take over funding this help. On Wednesday, a judge dismissed the application, saying the consultation process had been lawful. 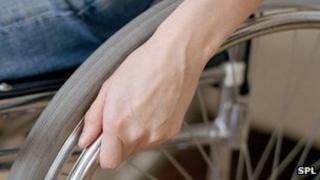 The claimants feared that disabled people could be forced out of independent living arrangements and into residential care, or trapped at home by the fund's closure. At a hearing in March, they had argued that there have not been clear reasons given for closing the fund; the consultation featured inadequate information on the differences between the fund and local authority assessment and provision; and there had not been proper assessment of the impact of the change on disabled people's ability to live and work independently. The Department for Work and Pensions has previously said that help for disabled people has been fundamentally changed by personal budgets, intended to give recipients more control, and that it makes sense to have a single system administered by local authorities. The ILF was established in 1988, but the government decided in 2010 that it had become "no longer appropriate or sustainable" to keep running the scheme outside the mainstream social care system. The fund closed to new applicants soon afterwards. One of the five applicants, Gabriel Pepper, from Walthamstow, east London, has accused the government of imposing "appalling cuts" which were "a vicious attack on the disabled". The claimants have said the money enables them to employ personal assistants to help them with their personal needs and to "go out and have a full life". Richard Hawkes, chief executive of the disability charity Scope, said: "Expecting councils to pick up the tab when they are facing the biggest funding cuts in history is an impossible ask." "Not getting the support to wash, dress and leave your home is unacceptable."